There was some planning done by RIDOT back in 2003 about the Dean-Cahir-Stewart corridor (report here ). 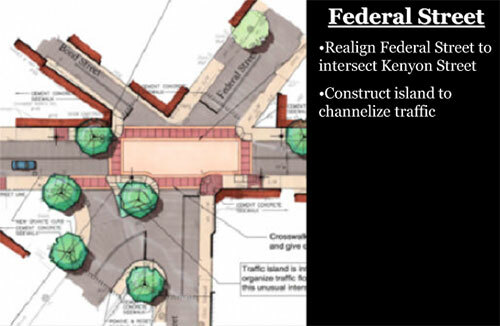 Part of that planning was the redesign of the Federal Street and Dean Street intersection (see image above). The current configuration of the intersection sees 6 streets coming together with little in the way of traffic controls and large gaps for pedestrians to cross. 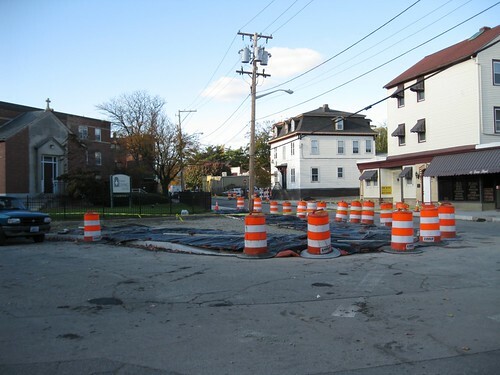 The new configuration has eastbound Federal Street traffic terminating at a T intersection with Kenyon Street, then Kenyon Street intersecting at a right angle with Dean Street, continuing across to Federal Street. In the 2003 proposal, there was a right turn lane from Dean Street southbound onto Federal Street westbound. This is not being built. Though motorist would probably prefer it over having to now make two rights to get onto Federal Street, as a pedestrian I prefer it this way. 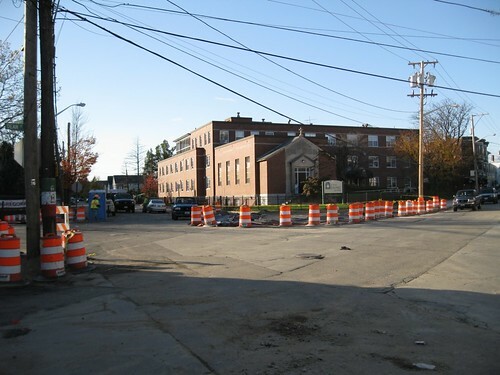 In the current configuration, pedestrians on the west side of Dean Street have to cross approximately 85 feet of Federal and Kenyon Streets travel lanes, with traffic coming and going from various directions through that 85 feet. This new configuration will greatly reduce the amount of space pedestrians need to cross and the multitude of directions that traffic moves through. It will also make more sense to drivers, currently Kenyon and Federal both have stop signs, but it is not clear which street has priority approaching Dean Street. I’ve been in cars with many drivers unfamiliar with the intersection who are quite intimidated by it. The new configuration shows drivers that Federal must stop at Kenyon, turn left, then stop at Dean before proceeding. This new configuration should prove to make the intersection make much more sense for both drivers and pedestrians, making both safer in traversing it. So that’s what they’re doing. Thanks for the photos. I don’t often get over that way. Jef – That last photo is a cool streetscape too. Buildings are dense and compact but not overwhelming. Cozy neighborhood feel with ground floor businesses and residences side by side and blending together well. I agree, that section of Dean has a nice array of ground level retail in otherwise residential buildings. Not all the retail spaces house retail now though, there’s not a critical mass that makes it a strollable retail street, plus the fact that the pedestrian environment has been so poor. With the fixed sidewalks and reconfiguration of this intersection, the streetscape makes for a more attractive retail environment. This area should be a bridge between the lower Broadway retail area and Atwells. Everything is just not quite mature enough to reach a good critical mass to make a truly impressive retail environment. The vacant lots between Dean and the highway are not helping matters either. 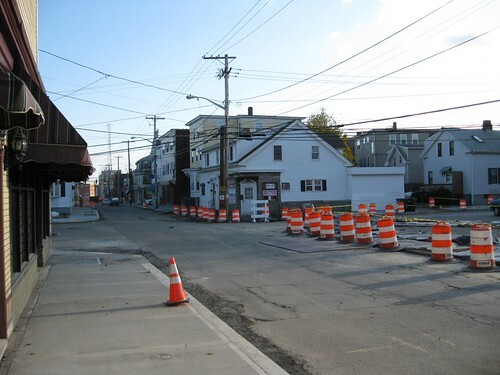 Providence: Dean St., from Atwells Ave. to Westminster St., and Cahir St., from Westminster St. to Broad St., expect various sidewalk closures for construction, Wednesday-Friday from 7 a.m. to 3:30 p.m.
Good, I was getting a little cranky about the fact that they just stopped working and left the sidewalks half done. Although, the sidewalks that are in the most disarray right now are between Broadway and Westminster.